To mark the 30th annual World Peace Day Ailsa has chosen White this week. I’ve chosen three peaceful white scenes to share with you. The first is taken in Beer, a little fishing village in East Devon. Beer is on the Jurassic coast and it’s a place I visit regularly. It’s always mystified me because it has white cliffs, but as you can see in the distance, the cliffs to the east at Seaton are red, as are the next around to the west. 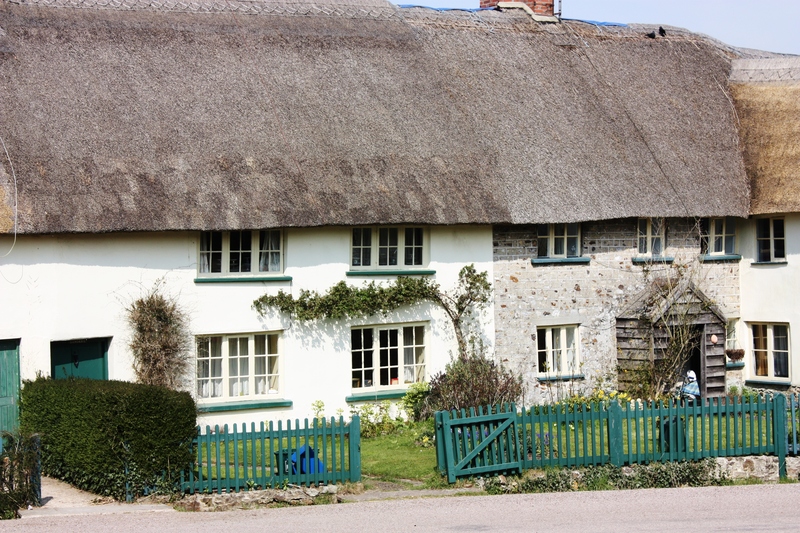 Next, a pretty white thatched cottage also in Devon. 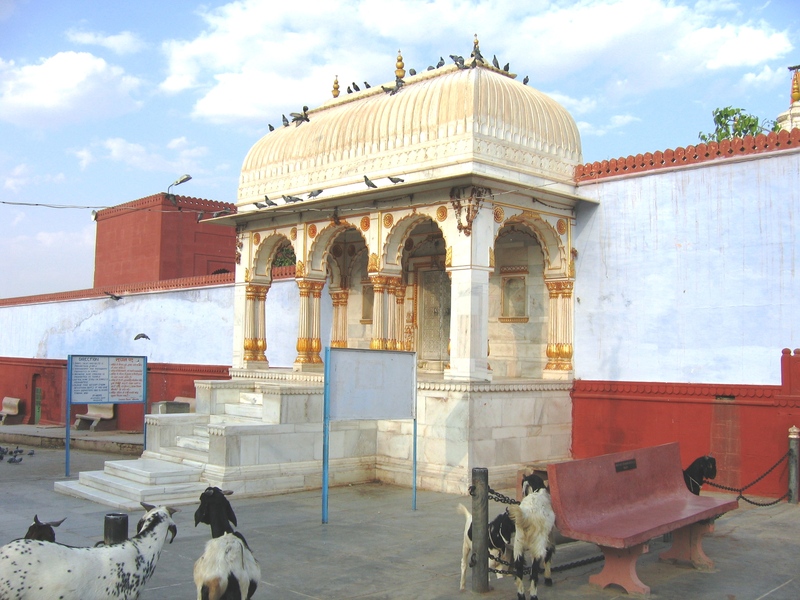 Finally, a lovely white entrance to a temple in Bikaner, Rajasthan. The door is solid silver. Please go and visit Ailsa – it’s worth the trip for the white peacock! I haven’t made it to Beer … yet! Fascination point about the different colours of the cliffs on adjoining coasts. Nice grouping of photos, Gilly. Love all the birds on top of that beautiful temple entrance. 😉 Pretty little cottage too. 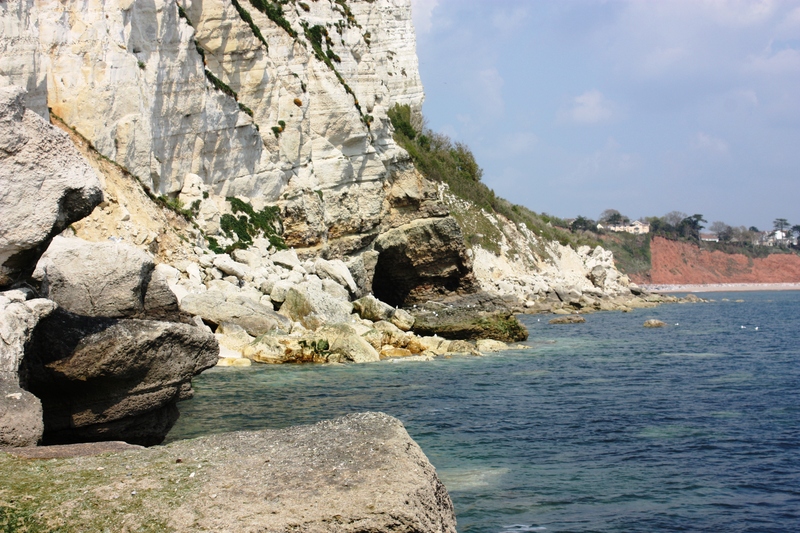 I suppose the white cliffs are chalk, and the red ones are mudstone which we had a lot of in Nottinghamshire where I was born and brought up. Mudstone is about 200 million years old. Mind boggling! All of these are beautiful, but that coastline is magnificent. And I adore that “cottage.” I told “Dorset Rambler” recently that I get such a kick out of the way the English refer to a very large house — with many rooms — as a “cottage.” Here in the states, that term is reserved for a very small unit — generally not more than about 4 rooms. I used to get tickled when I read English novels, and they began describing the “cottage” that the people lived in. They were generally two-levels, with a fairly elaborate floor plan, and loads of room. I’m used to the English definition of the word now, and I don’t think I’ll ever be able to think of an American “cottage” the same way. I’m sorry to spoil the illusion but English cottages are almost always small! Three bedrooms is about it and often you have to go through one to get to another! Rooms tend to be small with low ceilings and thick walls. A close friend lives in a real ‘chocolate box’ one, absolutely lovely but in winter nothing warms it up, in summer its pleasantly cool on the very hottest days. My photo isn’t one but two cottages and a bit of a third on the right. Oh and thatches? they harbour insects,have to be expensively redone too often and make home insurance expensive because of the fire risk!!! Oh, if we could only live in a make-believe world where things are what we WANT them to be! I could live happily in that cottage Gilly to the end of days. Oh,my goodness those photos are beautiful.The temple entrance is solid gold.Here they would have them carved out in no time.I loved this post. There all wonderful photos, gilly. I like the 2nd best of all. It is what I imagine England is like if I was to visit the countryside. It looks like a charming house. Nice entries ….!!!! Love all three Gilly! Have not been to Bkaner yet!! Beer had me mystified too with it’s blue waters and white exciting cliffs. A great play to reflect and find oneself. Beautiful. Have a great weekend my friend. Wonderful images! It is gurious about the white cliffs. I LOVE that cottage! Great photos! I like the cozy appearance of the cottage. Wonderful photos, Gilly! The red cliff makes an amazing contrast (and almost looks like it’s made of brick), and the white cottage is delightful, especially with the green fence and door for contrast. But my practical nuisance of a mind wonders: how often do they have to polish that silver temple door?? OW! I want to get soaked with all the beer can offer. Bwahaahahaha 😀 No seriously, I love the rock formations by the water the most. Awesome photos, Gilly. I love the cottage but also the temple. The cliffs are hauntingly beautiful too. Shucks. I like all of these. That fence is the best!